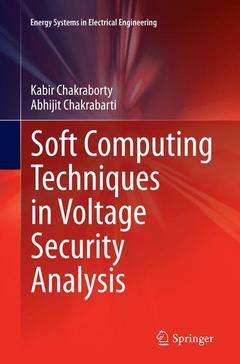 This book focuses on soft computing techniques for enhancing voltage security in electrical power networks. Artificial neural networks (ANNs) have been chosen as a soft computing tool, since such networks are eminently suitable for the study of voltage security. The different architectures of the ANNs used in this book are selected on the basis of intelligent criteria rather than by a “brute force” method of trial and error. The fundamental aim of this book is to present a comprehensive treatise on power system security and the simulation of power system security. The core concepts are substantiated by suitable illustrations and computer methods. The book describes analytical aspects of operation and characteristics of power systems from the viewpoint of voltage security. The text is self-contained and thorough. It is intended for senior undergraduate students and postgraduate students in electrical engineering. Practicing engineers, Electrical Control Center (ECC) operators and researchers will also find the book useful. Voltage Security – An Introduction. Load Flow Studies. Voltage Stability and Security Analysis. Voltage Security Analysis by Classical Methods. Soft Computing Techniques - An Overview. Multi-Layer Perceptron (MLP) with Error Back-Propagation Learning in Voltage Security Analysis. Classification of Voltage Security States Using Unsupervised ANNs. Classification of Voltage Security States Using Supervised ANNs. Kabir Chakraborty is Assistant Professor in the department of Electrical Engineering at Tripura Institute of Technology, Narsingarh, Tripura, India. He is a Former Head of the department of Electrical Engineering of Tripura Institute of Technology. He holds B.Sc (Physics Hons.) from Assam University in 2000 and B.Tech and M.Tech in Electrical Engineering from the University of Calcutta in 2003 and 2005 respectively. He completed his PhD in 2013 from Indian Institute of Engineering Science and Technology (IIEST), Shibpur, (Formerly Bengal Engineering and Science University, Shibpur) West Bengal, India. He has more than 10 years of teaching and research experience. His areas of research interest are Voltage Stability and Artificial Neural Networks. He has published several papers in international and national journals and conference proceedings. Abhijit Chakrabarti is currently Professor of Electrical Engineering at Indian Institute of Engineering Science and Technology (IIEST), Shibpur, ( Formerly Bengal Engineering and Science University, Shibpur,)West Bengal, India. He is a Former Vice-Chancellor of Jadavpur University and former Vice Chairman of West Bengal State Council of Higher Education. His areas of research interest are Electrical Power System Engineering (Specially Voltage Stability, Economic Operation, Deregulation, and Congestion Management and FACTS Devices). He completed his Ph.D. in 1991 from Calcutta University. He holds B.Tech from NIT, (Formerly R. E. College), Durgapur and M.Tech from IIT Delhi in 1978 and 1987 respectively. He has 7 years of industrial and 27 years of teaching and research experience. He also has to his credit 13 books and 121 contributed papers in journals and conferences. Dr. Chakrabarti is a Fellow of The Institution of Engineers (India).